This class includes 2 bags, a box, a belly band, a scrapbook or shadow box page, a banner, pinwheels, and EIGHT cards! I’ve made a full-color tutorial with detailed instructions, and there are SEVEN videos. I do have a kit option, but the kit only includes 6 projects. Included in the kit are 1 bag, the belly band, the scrapbook/shadow box page, the banner, and two of the cards. 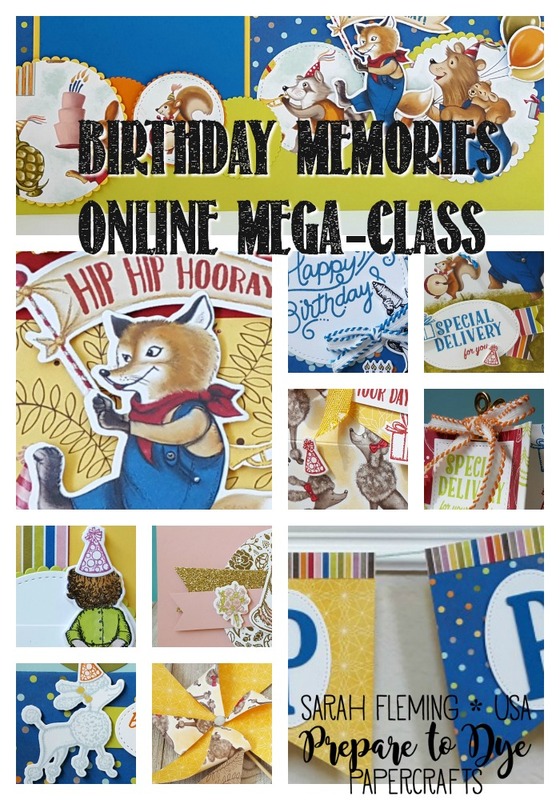 Note that the kit will not include your adhesive (Dimensionals and Mini Dimensionals are included) or the 12×12 paper for the scrapbook page and will not include the Birthday Memories paper, as that comes in the Birthday Delivery bundle. 1) Buy the Birthday Delivery bundle from my online store (click here) before August 20th, and I will send you the tutorial for FREE. Make sure you enter a good email address when you order the bundle so I can email you the link to the tutorial. (US residents only.) If you don’t receive the tutorial link within 24 hours of purchasing the bundle, first check your spam folder, and then email me. 3) You may buy the PDF by itself for $20. Click this button to buy it, and you will be able to download the tutorial immediately. I hope you love the class as much as I loved making it!